Chris Squire, the bass guitarist and co-founder of 1970s British progressive rock band Yes, has died at the age of 67, his bandmates have said. Current Yes keyboardist Geoffrey Downes tweeted: "Utterly devastated beyond words to have to report the sad news of the passing of my dear friend, bandmate and inspiration Chris Squire." Squire revealed in May he was suffering from a rare form of leukaemia. The band said he died "peacefully" in Phoenix, Arizona, on Saturday night. "It's with the heaviest of hearts and unbearable sadness that we must inform you of the passing of our dear friend and Yes co-founder, Chris Squire," said a statement on the band's official website. Squire said in May that he had been recently diagnosed with acute erythroid leukemia, which would force him to miss the band's summer co-headlining tour with Toto. Yes were formed in 1968 when singer Jon Anderson met self-taught bassist Squire in London. Their big break came a year later when they signed to Atlantic Records after opening for Janis Joplin at London's Royal Albert Hall. Their debut single, Sweetness, and first album, Yes, were released later that year. Other albums included 1971's Fragile, 1972's Close To The Edge and 1977's Going For The One. In 1983 they released the album 90125, which featured their classic hit Owner Of A Lonely Heart. That went on to become a US number one hit in January 1984 despite only reaching number 28 in their home country. Squire also released a solo album, Fish Out Of Water, in 1975. The group's most recent studio album, Heaven & Earth, came out last year. Squire, who was born in Kingsbury, north-west London, was the only member of the group to feature on every studio album. Musicians and fans took to Twitter and Facebook to pay tribute. John Petrucci, founding member and guitarist for American progressive metal band Dream Theater, tweeted: "Thank you for all of the amazing music Chris Squire. You will surely be missed." 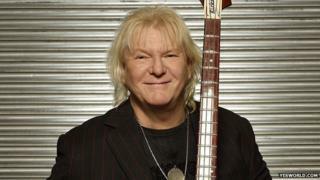 Rage Against the Machine guitarist Tom Morello wrote: "RIP Chris Squire, super bassist of Yes. An extremely talented musician's musician who mastered his instrument and took it to new realms." American rock guitarist Joe Satriani posted: "R.I.P. and thank you Chris Squire. #ChrisSquire,#yes"
The band posted on their official website to say they would have more information for fans soon, adding: "Thank you for all your heartfelt tributes on Facebook and Twitter."